The beauty of the High Line restoration. In the early 1930s, twin iron trestles were bruited through Chelsea and the West Village, one carrying a railroad linking various businesses in the area, the West Side Freight Railroad, and the other, the Miller Highway, carrying auto traffic along the far west side of the island, seemingly freeing the north-south avenues from choking car traffic and exhaust. The plan worked well for nearly fifty years; but as manufacturers and meatpackers gradually began to leave the Far West Side, the freight railroad carried fewer and fewer customers until, finally, the railroad ended its run in 1980. The Miller Highway, called the West Side Highway by all its users, fell victim to neglect—it was seemingly never maintained or even given a paint job until the road began to collapse in the early 1970s. It was finally razed in the 1980s, replaced by what is now called the Joe DiMaggio Parkway, a busy at-grade roadway. The massive, ambitious Westway project, proposed in the 1970s, would have placed the roadway underground and surfaced it with a park; it too fell victim to community opposition. In 1999, a not-for-profit organization called Friends of the High Line formed with the mission of preserving the High Line and converting it into recreational space. FOHL’s nuts and bolts community work, support of friends in high places, and diligent fundraising are too involved to enumerate here—but they are batting a 1,000: unlike the city’s other grandiose projects, well or ill-considered, such as Moynihan Station or Second Avenue Subway, which have floundered for years, reconstruction of the High Line is now mostly complete, and the remaining elevated freight trestle from Gansevoort to West 34th Streets has opened as a high-concept public park, and has been a smashing success, mostly with out-of-towners. 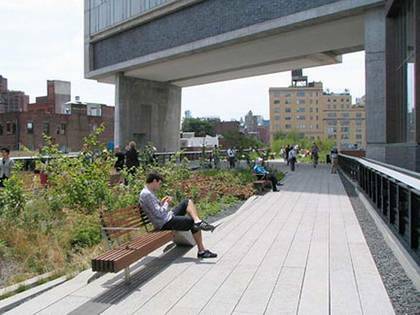 In the summer especially, foot traffic slows to a crawl on the High Line, as walkers gawk at the sites, and stop for photo views or selfies. The Chelsea neighborhood through which it runs was once relatively affordable, but the opening of the High Line has led to property values skyrocketing—great news for developers who have put up innovative, unusual architectural apartment buildings and hotels (such as the Standard, above) but bad news for the gas stations and mom and pop stores that have had to vamoose from drastically raised rents. While the rehabilitation of the High Line, which saw its last freight train in 1980, as a lively urban space is one of the more exciting, yet controversial, things to happen to NYC’s streetscapes in years, it’s not the first such transformation to take place. Less-publicized rails to trails and roads to trails projects have taken place in previous decades, though none have made quite the splash the High Line has. Take the #1 train all the way to its last stop at West 242nd Street, walk east along a weedy, occasionally muddy trail marked by telephone poles studded with rusted lamps that haven’t worked in decades, and at length you will find yourself at a stone overpass stamped with the date 1904. 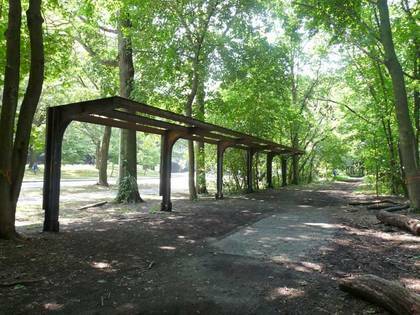 Instead of passing under it, clamber to the top of the trestle, and you will find yourself on the John Muir Nature Trail in Van Cortlandt Park, which was converted from the old Putnam Branch of New York Central. It saw its last passenger trains in 1958 and last freight service in 1980. Stroll a bit north on the path and you’ll find the skeleton of the passenger shelter that used to be the Van Cortlandt station (the line has a stop for summering Bronxites in the park). Press further and on the left a series of stone pillars appears. In the 1910s, before the Grand Central Terminal was built, it was decided to test different varieties of stone. These pillars were used to make the decision (the cheapest variety was ultimately used). Deep in the heart of Queens, running mostly in Cunningham Park from Francis Lewis Boulevard in Fresh Meadows to Winchester Boulevard near Union Turnpike (and the forbidding Creedmoor Psychiatric Center) runs the urban bike and pedestrian trail ironically known as the Motor Parkway, though gasoline powered traffic has not used the roadway since 1938. 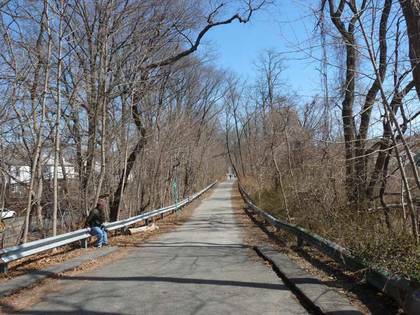 The Parkway has a venerable history dating back to 1904, when industrialist heir William Kissam Vanderbilt instituted the Vanderbilt Cup Race on former wagon trails Jericho Turnpike, Bathpage Turnpike, and Hempstead Turnpike—then farm-to-market unpaved roads. The race attracted thousands of spectators every year despite dangerous conditions that produced occasional fatalities among its participants. In 1906, after several spectators broke through a wire fence in Mineola, a race car smashed into a crowd, killing a spectator. Vanderbilt then decided that the Cup Race needed a separate course. After a persuasive public relations campaign, land in the middle part of Long Island from the Queens line to Lake Ronkonkoma was purchased, although enough farmers and landowners held out along the original proposed route to make the new Motor Parkway a twisting, turning route. Construction began in June 1908 and the first phase of the Motor Parkway was completed in 1910. The Parkway pioneered the use of overpasses and bridges to avoid intersections with previously existing roads. Tragedy, though, was a constant companion of the Vanderbilt Cup Race, and after the 1910 tilt, in which four people were killed and twenty injured, the race was never held again on Long Island. Indianapolis, Indiana became the national capital of auto racing. The Motor Parkway, then, began its second phase as a local toll road. Vanderbilt originally charged $2 at each of the road’s 12 tollbooths along its 43 mile route from the Queens-Nassau border to Lake Ronkonkoma—double digits in today’s money! The toll was later reduced to $1, and the Motor Parkway became a major east-west route, plied by 150,000 vehicles annually during the 1920s. It was still the best-quality road in the area then, since the Northern and Southern State Parkways had yet to be built and Jericho and Hempstead Turnpikes were still two-lane farm roads. Vanderbilt continued to expand the Parkway westward, reaching Springfield Boulevard in 1911 and eventually, to Horace Harding Boulevard in what is now Fresh Meadows by 1926. Its final length was 45 miles. The Depression, combined with Robert Moses’ aggressive road building, combined to doom the Parkway. Traffic was siphoned off the narrow Motor Parkway by Moses’ superior roads. Vanderbilt turned the Parkway over to New York State in 1938 in exchange for back taxes, without having made a cent of profit. The easternmost 13 miles of the parkway in Suffolk County continues as an auto trafficway, and the three westernmost, in Queens, is now maintained by the New York City Parks Department. You can still see the wooden posts that held the road’s guard rails here and there, and a few of the then-ingenious overpasses have been left intact, exactly as they were in Vanderbilt’s day. 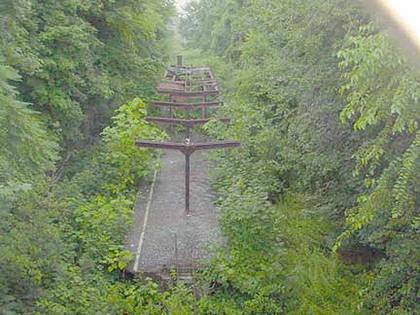 There are two abandoned railways in NYC that could very conceivably be used as pedestrian and bicycle trailways, though because the city always seems to have a vague plan to reactivate them for rail traffic, no movement has occurred toward rehabilitating them, and they have been pretty much left for nature to reclaim. The first is the old Long Island Rail Road Rockaway Branch, running from the LIRR’s main line in Rego Park south to Liberty Avenue, where the southernmost section of the branch was converted to NYC subway service in the 1950s. The remainder of the line has been inactive since LIRR service ended in 1962. A hike down the line (recommended only in winter when leaves are gone from the vegetation) reveals a graveyard of ancient train signals and the remains of forgotten passenger station platforms. The latest plan floated for the Rockaway Branch includes a combination rail tunnel/elevated trestle, with a park built over the tunnel. This would require years, maybe even decades, of planning and construction, and at my age (60) time is running out to see such grand plans in actual service. 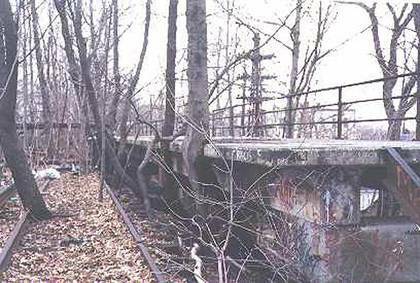 A second abandoned rail line that would make sense as a reclaimed urban trail is the Staten Island Rapid Transit North Shore branch, which runs along the Kill Van Kull from the ferry terminal out to the Arlington Yards and crosses a bridge into New Jersey. The stretch into NJ has been reactivated for freight, but the rest of it lies mostly intact, with the requisite station skeletons scattered here and there. It has not seen passenger service since 1953. The latest master transit initiative lists it as a possible candidate for reactivation as a light rail niche, but that’s not likely to happen. It would make much more sense to partially restore it, leaving some natural elements intact as was done on the High Line. Dreamers can dream, but in NYC, restorations like the High Line’s come along once in a generation.